Who invented the airplane? When were airplanes invented? And why do planes have wings if the wings don't flap? Kids can answer these questions and more by jumping into the cockpit and soaring into Explore Flight! 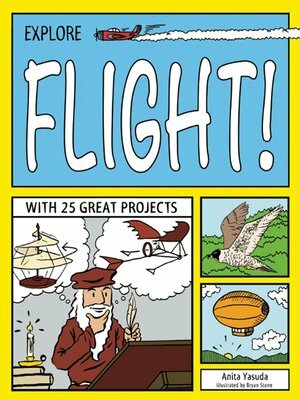 With 25 Great Projects, where they'll learn about the history of our human obsession to conquer the feat of flying. For kids ages 6-9, Explore Flight! With 25 Great Projects introduces them to the dreamers, inventors, aviation pioneers, and record breakers. They will read about the myths and legends of flying and about the wondrous flying machines of the past, present and future. They will learn that in the 15th century Leonardo da Vinci drew sketches of airplanes, helicopters and other flying machines, and that the first passengers in a hot air balloon were a sheep, a rooster, and a duck. Along the way, they will develop a better understanding of the rich history of aviation, investigate what causes flight, and learn about the science of aerodynamics. Projects and experiments range from making a paper airplane to building an airfoil. All the projects in this book are easy to follow, require little adult supervision, and use commonly found household products, many from the recycling.